A gift to you from FOX Sports Kansas City. KANSAS CITY, Mo. — Royals fans can celebrate the holidays with baseball. FOX Sports Kansas City will replay four of the best Royals games of 2013 on Tuesday, Dec. 24. The Christmas Eve marathon starts at 2 p.m. with the Royals’ May 31 win at St. Louis that ended at 3:14 a.m., and wraps up with Justin Maxwell’s memorable grand slam winner on Sept. 22. The full schedule is below. Each game will be condensed into a two-hour window. 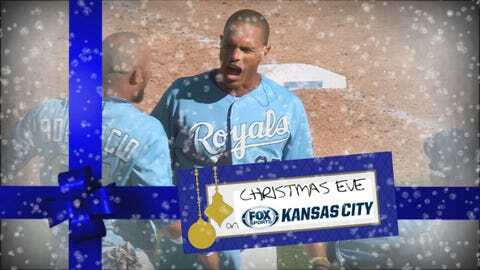 The Royals Christmas Eve marathon will be available on FOX Sports Kansas City and FOX Sports Midwest in western and central Missouri, Kansas, Nebraska and Iowa. DirecTV subscribers will find it on channel 671 and Dish on channel 418. The Royals come back to win in the ninth in a game that ends at 3:14 a.m. after a 4-hour, 32-minute rain delay, on the day George Brett is named interim hitting coach. Alex Gordon homers to start the game and wins it with an RBI single in the 10th. Eric Hosmerâs home run ties it in the eighth, Alcides Escobar wins it in the ninth. Justin Maxwell clubs a memorable walk-off grand slam.